Milan during the Salone del Mobile is the busiest place in the world with events, exhibitions and presentations happening simultaneously in different locations with over thousands visiting every day. If you have travelled here from a different country or location, you may want to cover all places and not miss any during your short time in the fair. Here’s a simple guide to help you visit all interesting exhibitions and places without missing out on anything. Salone del Mobile is the world’s largest furniture fair held annually in Milan. The fair has multiple names like "Salone", "Milano Salone", "Milan Design Week", and “Milan Furniture Fair”. It’s a weeklong event packed with talks, exhibitions and presentations showcasing the latest in furniture and design from countries around the world. This event is a perfect opportunity for amateurs and design enthusiasts to meet the well-known designers in the industry, brand manufacturers to meet with architects and business clients and interior decorators to build their contacts. It’s the cornerstone for brands to display their new products and designs in the spectrum of furniture, lighting and other home furnishings. Every year in April, the Salone del Mobile is held in the Fiera Milano complex in the Milan metropolitan area town of Rho. What you should do: Visit Salone Del Mobile located at the Rho Fiera Milano metro station. You need at least 6 hours to visit the exhibition. Thousands of visitors every day, which means you shouldn’t take the metro during the peak hours (9.30 - 10.00) or on weekends. You can take a taxi instead and cover all important places and events. Fuorisalone events take place simultaneously with Salone del Mobile which forms the core of Milan Design Week. Unlike Salone, Fuorisalone is low-pitched when it comes to public awareness which is slowly changing. The Fuorisalone is not a fair event, it doesn’t have a central organisation and it’s not managed by any Institution. It started in the early 1980s through companies working in the furnishing and industrial design sectors. Being promoted independently by individual companies and designers, today it is expanding into many related sectors including automotive, technology, telecommunications, art, fashion and food. Fuorisalone works as a set of events and exhibitions that animate Milan in April's period in correspondence with the Salone del Mobile's week. During the week, it draws lot of designers, architects, students and professionals from all over the world. There’s an entire city to explore apart from the Salone fair; more exhibitions, lot of inspirations, a lot of design in every street. 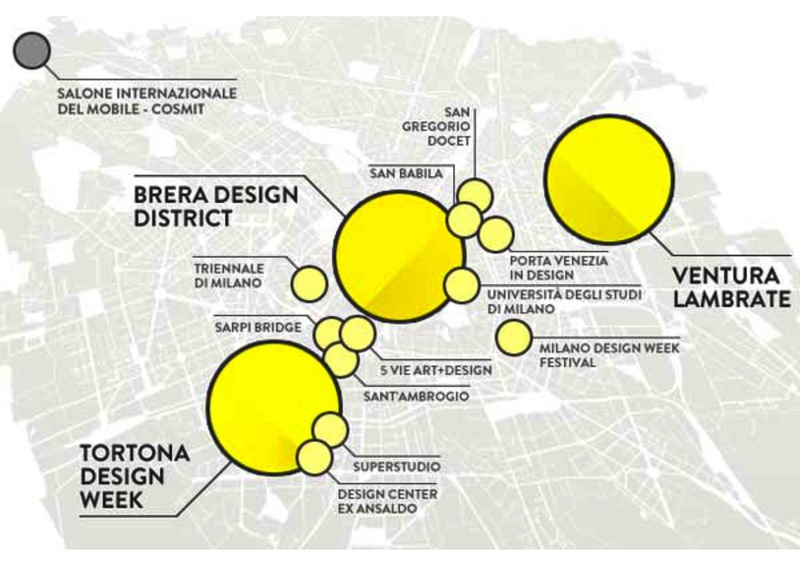 The Fuorisalone events are scattered all over Milan but concentrated in three main districts, four strategic areas and more dedicated projects. What you should do: Visit the events from Fuorisalone which includes Zona Tortona, Brera Design District, Ventura – Lambrate, Università Statale, Triennale Di Milano, S. Babila, Porta Venezia In Design, Rossana Orlandi. 1. Zona Tortona, also called Tortona Design Week, is an integrated communications project promoting the events, installations and projects that are taking place in the Tortona district during the Fuorisalone event. Tortona is the district of Fuorisalone that first brought together the foremost brands in Italian and international design with famous as well as young designers in the impressive spaces of its many former industrial warehouses, that have always made it an eagerly-awaited event, visited by thousands of people. 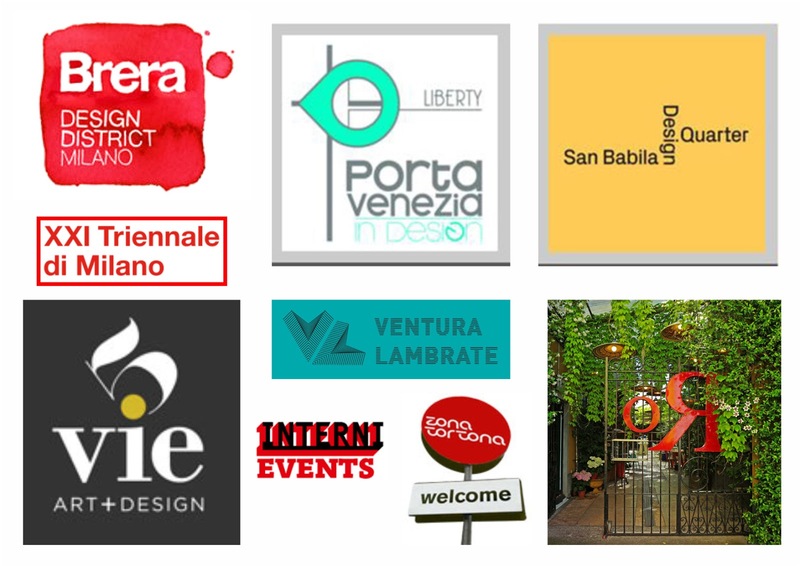 The partners of the initiative are: Associazione Tortona Area Lab, BASE Milano, Magna Pars, Milano Space Makers, Superstudio Group and Tortona Locations. What you should do: Once you arrive there you will find a map that will explain the local itinerary. Over 200 events in the Tortona district, where design, fashion and culture converge all year round. 2. Brera Design District is Italy’s most important district for the promotion of design, an international point of reference and a centre of Milan’s creative, commercial and cultural development. It is the area where all the showrooms of the most important design brands are placed. The aim is to bring together and promote businesses on an international scale in the furnishing sector and professionals in contemporary industrial design, while benefitting from the area’s historical and artistic resources. What you should do: Brera Design District is located at LANZA metro station. It takes about 4 hours to visit the area. Interesting areas to see include – Kartell, Nodus, Fritz Hanses, Magis, Dilmos, Richard Ginori, Paola C, Foscarini. 3. Ventura Lambrate in the last few years became an interesting place to visit during the design week, because it is reserved to the new generations of young designers. Ventura Projects are curated exhibition areas that present the latest developments at the forefront of contemporary design. Throughout the week, the beautiful Lambrate district in Milan will be filled with exploration of new technologies, design research, projects, prototypes, prestigious installations, joint initiatives, crossovers between the design world and other disciplines and academies exhibitions. The participants include renowned designers with emerging talents, independent studios with established brands, design academies, galleries and institutions. 4. The Univestità degli Studi di Milano, also known as Università Statale, is the place where Interni magazine every year designs a beautiful show focused on a theme. In these last years the magazine Interni became a very important reference for the Fuorisalone lovers; it collects the most important events and exhibitions that take place during the week in alphabetical order or by thematic itinerary. It’s the best friend one can have during the Design Week. What you should do: This year the theme of Università Statale is Energy for Creativity. The event is located at Missori metro station via Festa del Perdono 7. Duration to visit the event is about 2 hours. 5. The Triennale di Milano has an important role during the Design Week. It collects the interesting exhibitions. The exhibition makes its comeback after twenty years. From 1923 La Triennale di Milano is a cultural institution that produces art, design, architecture, fashion, film, communication and society exhibitions and events. The XXI Triennale di Milano International Exhibition has a vast program of exhibitions, events, competitions, festivals and meetings throughout the city, in venues ranging from La Triennale (Palazzo della Triennale) to the Fabbrica del Vapore, Pirelli HangarBicocca, the Politecnico di Milano campuses, the IULM campus, MUDEC, the National Museum of Science and Technology “Leonardo da Vinci”, BASE Milano, the Palazzo della Permanente, the Pirelli Tower, the Ex Expo Site, the Museo Diocesano, the Pirelli Foundation, the University of Milan, the Accademia di Belle Arti di Brera, the Triennale Expogate through to the Villa Reale in Monza, the historic site of the first International Exhibitions. What you should do: Travel to the exhibition located in Cadorna metro station. It will take you about 2 hours to visit the exhibition. This exhibition will be open till September throughout the city. 6. S. Babila also known as San Babila. In the streets around Piazza San Babila are placed the showrooms of the most important lighting brands and other furniture brands. Usually these exhibitions are the end part of the itinerary of Brera Design District. What you should do: Visit San Babila metro station and have a glimpse of the events which may take around 2 hours. 7. Porta Venezia in Design. This event remains central to the attention paid to the cultural and architectural tour of sixteen wonderful Art Nouveau buildings. It is a ‘Fuorisalone’ circuit outside the salon that brings together the contemporary design and art with the architectonic and decorative heritage of the Modern Style (Liberty). This enriches the very district of the city, to make it more well-known both to the citizens and to the foreigners, visiting Milan during the design week. A three circuit: showroom, shops and companies that showcases the latest in design and art and, this year, a cultural focus on Liberty. It is an itinerary for the Design Week to combine design, art, food and wine with Liberty architecture, in that area of Milan. Things to watch out for: The food & wine route, which is housed in a few rooms and selected restaurants, with creating menus designed for the outdoor show, but which also host exhibitions or content related to food design. What you should do: Visit the Porta Genova metro station. It will take you around 5 hours to visit the area. The must-see of this area are: SuperStudio Più (via tortona 27), Edizioni Corraini, Material ConneXion Italia, Moooi, Mudec (via tortona 56), PepsiCo. 8. The 5 vie art+design, or SantAmbrogio zone, is a design area that is growing a lot in the last editions. Thanks to the Rossana Orlandi gallery which is located close to this event. Many exhibitors are now interested to find a place in this part of the city because of the very quiet atmosphere, mostly dedicated to fine arts instead of commercial driven design events. What you should do: Visit Sant’Ambrogio / Cadorna metro station. Once you reach there you can have a look at the event which will take about 3 hours to check out the entire area. The must-see of this area are: Rossana Orlandi, Palazzo Litta, Museo della scienza Leonardo D. V.
9. Gallery Rossana Orlandi collects many different items around design every year which attracts lot of people to the place. The gallery has been forecasting along the years new and upcoming designers and establishing the premise as one of the most revered platform for avant-garde Design and Lifestyle. Named after the designer Rossana Orlandi, in 2002 she decided to transfer her passion for design as a private collector into an innovative gallery, a platform where to showcase her personal idea of design and lifestyle. Galleria Rossana Orlandi has also revolutionized the way to present design art pieces, showing them always in real ambiances, displayed together with different kind of products to recreate real houses situations and, taking advantage of the structure of the gallery itself composed by different rooms on different floor, all winding around a blooming courtyard. The space is articulated in a not traditional way mixing together, showroom, a retail store, offices and a courtyard for events and meeting with no boundaries between the different activities. What you should do: You need to go to the San Ambrogio metro station. At this junction, you’ll find the gallery which will take about 2 hours to visit the exhibition. Duomo rooftop: Get a beautiful view from this gothic cathedral by getting to the roof. Galleria Vittorio Emanuele: Have a look at luxury brands. 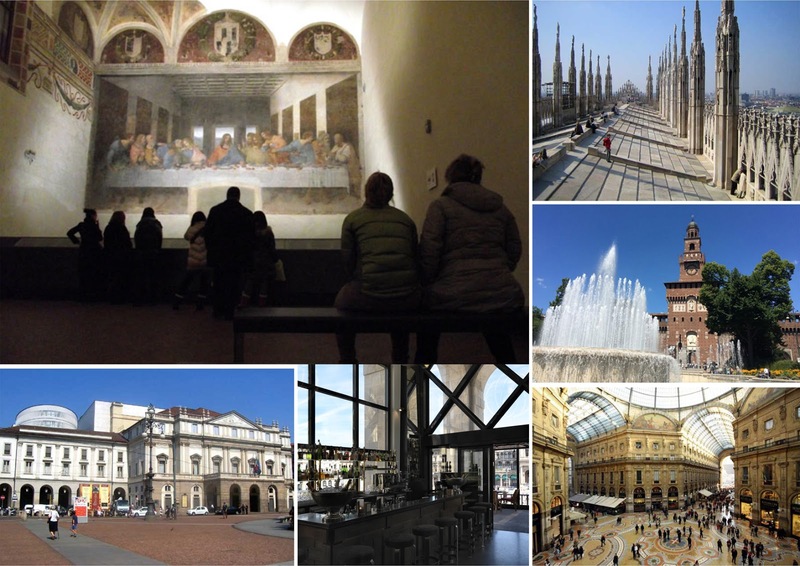 Also, the glass-and-iron dome, magnificent mosaics and marble floorways is a real must-see in Milan. Navigli waterways: Take a cruise through these canals and avoid the crowd. It’s a popular hangout with eccentric cafes, bars and quaint restaurants which intermingle with churches. Fondazione Prada: Dedicated to contemporary art & culture. HangarBicocca: It is a museum with 15,000 square metres of exhibition spaces, making it one of Europe’s largest centres for contemporary art. Museo Vigna di Leonardo: also known as Palazzo Degli Atellani, is a world famous due to the fact that the great Italian master Da Vinci lived here while painting The Last Supper. Celebrated mid-century Milanese architect Piero Portaluppi restored the property in the 19th century, but it’s the gardens and the courtyard in particular that steals the beauty. Teatro alla Scala: Visit the world’s most famous opera house, belies its opulent interior – featuring acres of red velvet and gilded balconies. Michaelangelo’s unfinished masterpiece, the Pietà Rondanini. Other places include: Royal Pavilion of the Milan Central Station, Palazzo Serbelloni – Piano Napoleonico, Cloisters of San Simpliciano, Ex Chiesa di San Carpoforo, Albergo Diurno, Villa Necchi Campiglio, Pinacoteca di Brera, Studio Achille Castiglioni museum. Having a drink the Italian way is a centuries-old tradition and it’s one that the Milanese have perfected.